Easily one of the most versatile additions to your kitchen linen collection, vinyl tablecloths are versatile, functional and even fashionable, all at once. Vinyl is a synthetic plastic composed of chlorine and ethylene, a byproduct of crude oil. The material is extremely durable, strong and resistant to humidity and moisture. Vinyl is also quite economical and available in a great many variations. Unlike other types of plastic, vinyl is recyclable. Given all of these practical traits, it is no wonder that so many people prefer tablecloths made out of vinyl to other kinds of materials. Vinyl is a sensible material for tablecloth construction because it is resistant to damaging stains caused by spilled food and beverages. It can also come in handy, especially for outdoor occasions, such as barbecues and picnics. Families with young children may also prefer vinyl over cloth, mainly because wiping up spills is such a simple task. Despite its overall functionality, vinyl is no slouch in the design department. In fact, there are plenty of styles available, ranging from simple solids to vibrant patterns. It is even possible to find vinyl tablecloths that feature a specific theme, which, of course, is ideal for things like costume parties, children's birthday parties and other theme events. Just like other kinds of tablecloths, those made from vinyl are available in various sizes and shapes to accommodate all types of tables, including square, circle and rectangle. Fitted, or elasticized styles are often ideal, since they cover the table perfectly without slipping and leaving any areas uncovered. Another option is a weighted tablecloth made of heavyweight vinyl. If you're setting up for an outdoor event and the weather is unexpectedly brisk and windy, a weighted tablecloth can prove especially helpful. If the weather report calls for rain, you can count on a weatherproof or waterproof vinyl tablecloth to stay in great shape no matter what the elements may bring. In addition to simple heavyweight vinyl, heavier tablecloths may be backed with flannel to give it more weight. Flannel is a great fabric backing for a vinyl tablecloth, since it's naturally stiff in comparison to slick vinyl. This added weight creates a stable backdrop for the tablecloth and prevents it from slipping and sliding all over the table. This can be especially important if there are young children running around the table. A heavy tablecloth can still be tugged, but it is much less likely to fall and damage your valuable or fragile kitchenware in the process. One of the best traits vinyl has going for it is the easy care it requires. There's a reason these tablecloths are also known as "wipe-cleans". Simply running a damp cloth over the tablecloth will usually do the trick, but a little warm water and mild soap work wonderfully for a more thorough cleaning. Stubborn stains, although very rare on vinyl, may be removed with dishwashing detergent and a damp sponge. 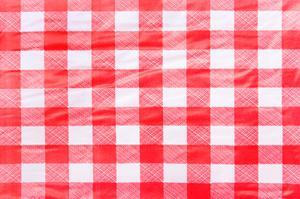 Some vinyl tablecloths, typically those with flannel backs, can be cleaned in the washing machine. It is imperative to read the care instructions on the packaging prior to putting the tablecloth in the machine, though. Otherwise, simply wipe it down! Keep in mind when and where you use your tablecloth. If you plan to reserve it primarily for special occasions, you might want to search for a more decorative style. If it's for everyday use, though, consider a simple, solid color or simple pattern that plays well with your kitchen décor. Finally, keep in mind that a tablecloth made of vinyl can also be used as a base layer if you use a thin, fabric tablecloth. The vinyl layer underneath will protect your table should any food or drink seep through the fabric.